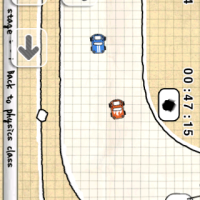 Doodle Kart is a doodle style top down racing game that is very much a blend of Mario Kart meet iPhone. Doodle Kart is all about racing and using whatever means necessary to become first place, which includes launching objects at your opponents. 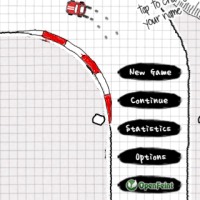 The game has a certain addictive element to it that mostly comes from its unique pen and paper “doodled” graphics. The entire game, including menus and all stages, have the look of being doodled or in other words, hand drawn. Obstacles during a level include such items as rulers and pencils to keep with the doodle theme. However during a race, your opponents and you both have access to items and weapons that are good for whoever fires first and bad for the recipient. Items and weapons are collected by driving over flagged areas on the race track. Weapons come in many forms, but one of the more useful weapons is a pencil which acts like a bullet and attacks opponents cars. Some of the items that can be collected include a car speed booster and an item to enlarge the car which can be used to run over opponents! There is a total of seven available items/weapons. The game includes five different environments for a total of 25 race tracks. The opponents you race against are controlled by AI and you always race against three AI. 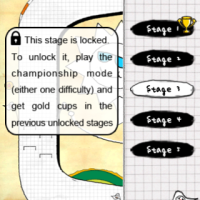 As such, the two game modes are Single Race mode, which includes a solo race or a race against the AI, and a Championship mode, where players can unlock new environments. Doodle Kart further includes four difficulties; Easy, Normal, Hard, and Nightmare. There is a fifth game mode called “Dark” but I was unable to unlock it. However if it is anything like Nightmare, I think I’ll avoid it as I am not worthy! For controls, I really appreciate the available options. Players can control the game by touch or tilt, of which I recommend touch as there are some really tight turns. Players can also opt for an Auto-gas option that enables the gas pedal for you. 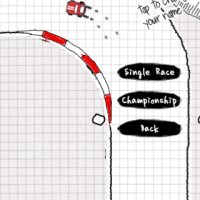 For screen orientation, players can race in portrait or landscape and for me, both were equally comfortable. 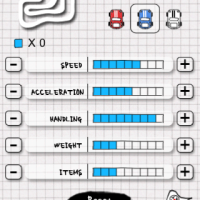 Doodle Kart also saves the best time for each track in a local score board and further supports OpenFeint for online score tracking for each race track. 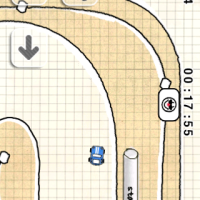 Doodle Kart is available in the App Store for $0.99. 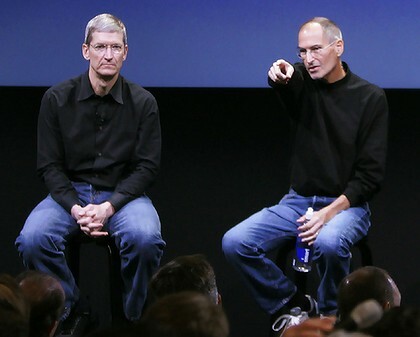 There is also a Lite version available for free.